Wolves are recolonizing California at a much quicker rate than anticipated, say officials from the California Department of Fish and Wildlife. A game camera recently captured pictures of a pack of gray wolves in southeastern Siskiyou County. 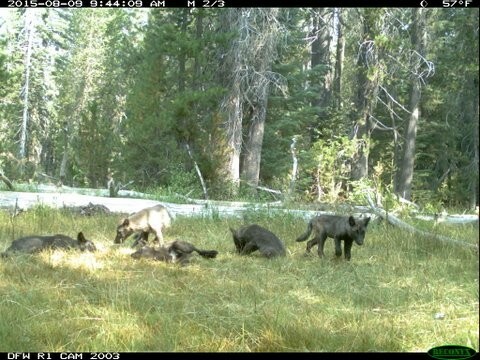 Karen Kovacs, the wildlife program manager who has been monitoring the movement of wolves along the Oregon border and into California, says that she believes this pack is unique from OR-7, the male whose travels into California fueled a conversation about how wolves would be managed once they entered the state. The last confirmed wolf sighting in the state prior to OR-7 was a pup captured in 1924. In June 2014, the California Department of Fish and Wildlife voted to list gray wolves as endangered under the California Endangered Species Act, making it illegal to "harass, harm, pursue, hunt, shoot, wound, kill, trap, capture or collect" them. The hearing, held in Fortuna, attracted more than 200 people to voice their opinions on the issue. Many ranchers expressed concern that, under the law, they would not be able to protect their stock. Kovacs was careful to underscore that Fish and Wildlife is not reintroducing the species to California. "In California we have no frame of reference for wolves," she said in a conference call, "This is not a recovery plan for wolves; we have no goals. California is very different than even Oregon, Washington or Montana." The department hopes to move up the date of its draft wolf management plan, now scheduled to be released by the end of the year. Eric Loft, branch chief of the wildlife department, said the discover of the Siskiyou wolf pack was a surprising development, and that no one in Fish and Wildlife anticipated that wolves would begin recolonizing California so quickly. "We are excited if not amazed at what this species has been able to do," he said.